Biopolymers such as polyhydroxybutyrate (PHB) are considered to be carbon-neutral, and thus environment-friendly, replacements for fossil fuel-derived plastics. They are more expensive, however, and production process costs must be reduced to increase market acceptance. Alternative feedstocks offer a promising way to reduce costs. This application note presents the process development and optimization of wheat straw hydrolysate fermentation to produce PHB in B. sacchari. 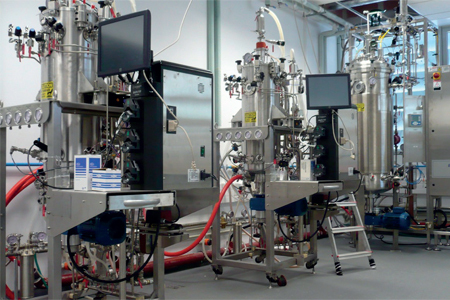 Process engineers at Biotrend® (Portugal) evaluated various ratios of two sugar concentrations on a small scale, using an Eppendorf New Brunswick™ BioFlo®/CelliGen® 115. They established automated feed triggers for the New Brunswick BioFlo 415, 610 and Pro fermentation systems, allowing them to successfully scale up the process 100-fold.